Countless professionals and students who use statistics in their work rely on the Encyclopedia of Statistical Sciences as a superior and unique source of information on statistical theory, methods, and applications. This edition is designed to bring the encyclopedia in line with the latest topics and advances made in statistical science over the past decade--in areas such as computer-intensive statistical methodology, genetics, medicine, the environment, and other applications. Written by over 600 world-renowned experts (including the editors), the entries are self-contained and easily understood by readers with a limited statistical background. 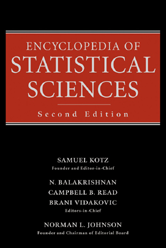 The Encyclopedia of Statistical Sciences retains its position as a cutting-edge reference of choice for those working in statistics, biostatistics, quality control, economics, sociology, engineering, probability theory, computer science, biomedicine, psychology, and many other areas.